Where to Buy Alkaline Water in Bulk? Surprise! You may be wondering where to buy alkaline water in bulk? Well if you are, this is the perfect article for you. By the time you finish reading my article, you will know what is the best possible next move for you to make. First, let’s take a look at the quick answer to this question. We should answer this question with a question. Why would we want to buy alkaline water in bulk? It seems like a good idea if we are already receiving water deliveries at our home, right? Why not upgrade to receive alkaline water instead? Well, there are several reasons why you should avoid buying alkaline ionized water in bulk altogether. Why do you want to drink negative ORP water? Should you buy from a local vendor? The main you should skip buying ionized water in bulk is the fact that it will most likely come in a clear plastic container that has been sitting around for who knows how long – perhaps even in the sun. One of my top 25 alkaline water benefits is that we can stop drinking water out of plastic bottles when we purchase a reliable alkaline water machine. If you want to see my top 10 list of best water ionizers, click here. Getting back to the point, alkaline water can degrade quickly if it sits in a plastic bottle. If you must drink it out of plastic, make sure the plastic is 100% BPA free. By the time it gets to your home, the ionized water will have much less of a positive impact on your health. The whole point of drinking alkaline ionized water is to drink it while it’s fresh. Much of the health benefits you get from drinking alkaline ionized water come from ORP, not from the actual pH of the water. Drinking water with a higher pH will surely help you, but the ORP is what floods your body with anti-aging antioxidants. There have also been studies where people experienced major relief of abdominal and intestinal issues by drinking high alkaline water with a higher negative ORP. These antioxidants also boost our immunity and give us the energy we crave to complete our daily and long-term goals. The ORP value of water is measured in millivolts or mV. When your filtered water goes through an alkaline water machine, the platinum-coated titanium plates in the machine create an electrical current in the water. The process is called electrolysis or electrodialysis. Don’t worry it’s a weak current and very safe. The water that comes out of the machine is easier for our bodies to absorb and has a high negative ORP value. A quality water ionizer can produce a negative ORP value of -800mV or lower. The ORP is a reading of the water’s antioxidant potential. The higher the negative ORP the better. For example, if you drink water with an ORP of -400mV, it has less antioxidant potential than water with an ORP of -700mV. Antioxidants from ionized water spread throughout our body to seek out free radicals and protect our cells from oxidation. Most of the water we drink from the tap and even from bottled sources has a positive ORP value. A positive ORP does the complete opposite of antioxidants. Water with a positive ORP causes oxidation in the human, which speeds up the aging process. Most tap water has an ORP of +200mV to +600mV. Oxidation is what occurs when metal rusts or a piece of fruit turns brown after it’s been cut and sits in the air. Are you starting to see why drinking water with negative ORP is so beneficial to the human body? People around the world are waking up every day to begin drinking alkaline water. You may be thinking that alkaline water is another health fad, but think about this. I lived in Taiwan, the Philippines, and other Asian countries. In each of those countries, alkaline ionized water is sold in the 7-Eleven and just about every convenience store. Would a First World country allow snake oil to be sold in every convenience store? No way! Japanese studies have concluded that alkaline water benefits all types of conditions, including diabetes. Now that you know what ORP value is, let’s think about what happens if you buy alkaline ionized water in bulk. Keep in mind, the quicker you drink the water once it comes out of the ionizer the better. The antioxidants in the water will quickly dimish if the water sits around for too long, especially in a plastic container. Glacial water is naturally alkaline and full of antioxidants because it’s living. When we drink alkaline ionized water for our health, we are drinking living water that is charged with healthy energy. If you choose to buy alkaline water in bulk, you won’t be getting all that fresh energy. In the long run, you will waste your money. Instead of wasting money on alkaline water in bulk, check out some of the alkaline water machines I’ve reviewed on my site. 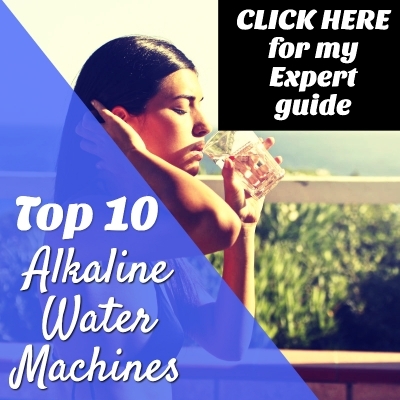 I spent countless hours researching the best alkaline water machines on the market to create my top 10 list. There are several ionizers that cost around $500. Most companies offer lifetime warranties and the Cosan Life Water unit allows you to virtually try before you buy with their 15-day money back guarantee. The reason premium alkaline water brands can offer lifetime warranties is the plates in the ionizers are made of platinum and titanium. Platinum and titanium are extremely resistant to corrosion. They will last you a lifetime and beyond. It may seem like a smart choice to buy from a local vendor. Maybe they will deliver the water in 5-gallon plastic jugs or smaller. The problem is that you will once again have the water sitting around for too long to get the benefits you want from the ORP value in the water. Leading Asian researchers have already concluded that ORP is more important than an alkaline pH in water to get the most alkaline water benefits. It’s actually a bad idea to drink water with too high of a pH. With an alkaline water machine, you can control the exact pH of your water. Most companies recommend starting with a lower alkaline water to allow your body to get used to drinking alkaline water first. Remember, you have more than likely consumed slight acidic water with a positive ORP for most, if not all, of your life. You don’t want to shock your body by drinking water with a pH of 9.5 or higher. When you begin drinking alkaline water, it’s best to start with a pH of 8.0 or 8.5 maximum. You will slowly work your way up to drinking pH 9.5 water, which will cleanse and detoxify the cells in your body while boosting oxygen levels. The key is to be patient, and your body will pay you back a thousand times over. If you buy alkaline water in bulk, you can’t control the pH of your water. If you are being a sold a single pH, how will you properly calibrate your healing journey? Also, children should not drink water with as high a pH as adults. When you have an ionizer, you can adjust the pH for your children. Whenever I’ve bought bottled alkaline water, I’ve noticed on the label that it has a pH range instead of a single pH. If your own an ionizer, you take the guesswork out of measuring pH in the bulk alkaline water you buy. The pH will most likely change anyway if the water sits in the bottle for too long. Who knows if the pH on the label is the actual pH you are getting? If you are not ready to buy an alkaline water machine, there are other alkaline water solutions available that are better than buying in bulk. Click here to see a reliable alkaline water pitcher. There are also countertop alkaline water filtration systems that use natural minerals to increase the pH of the water while filtering out impurities. Alkaline water bottles also exist that add minerals to the water. With alkaline water bottles, you should filter the water before it enters the bottle. There are also reverse osmosis alkaline water systems that add minerals back into the water after the water has finished going through the reverse osmosis process. When water goes through a reverse osmosis system, it is stripped of all its minerals. Water needs some minerals in it for it to be able to be alkalized. The main point is that with all these better options, the last decision you should make is to buy alkaline water in bulk. After the water has been alkalized and ionized, it’s best to store it in an insulated stainless steel bottle. This way, no air or light can touch your water. Once air or light touches your alkalized ionized water, you instantly begin losing the potential health benefits. Next time you ask yourself where to buy alkaline water in bulk, think twice about your decision. You will receive an inferior product compared to the fresh alkaline ionized water you can get from an alkaline water machine. You and your family’s health is more valuable than any sum of money in the world. In the end, buying in bulk will only end up being a waste of money. The investment for a quality alkaline water machine may seem big at first, but you will get the money back in saving before you know it. Read some of my reviews of alkaline water machines to see all the amazing health benefits families across America are experiencing right now. I’ve read countless stories about how people lost weight, got an energy boost, improved their sleep, healed skin conditions, and other inspirational tales. Join the club, and do it the right way. No evidence compels the conclusion that the minimum required intake of any vitamin comes close to the optimum intake that sustains good health.